Romansleigh is a village and civil parish in the North Devon district of Devon, England. It is surrounded clockwise from the north by the parishes of Mariansleigh, Meshaw, Chulmleigh, and King's Nympton. In 2001 its population was 98, compared with 155 in 1901. The parish church, dedicated to Saint Rumon, was completely rebuilt in 1868. ^ a b Harris, Helen (2004). A Handbook of Devon Parishes. Tiverton: Halsgrove. p. 142. ISBN 1-84114-314-6. Tawstock is a village, civil parish and former manor in North Devon in the English county of Devon, England. The parish is surrounded clockwise from the north by the parishes of Barnstaple, Bishops Tawton, Yarnscombe, Horwood and Newton Tracey, in 2001 it had a population of 2,093. St Peters church is, unusually for Devon, a church largely of the 14th century, the plan is cruciform and the site is in the former park of the Earls of Bath. The collection of monuments is particularly fine, most of the persons commemorated are members of the family of the Earls, connections of theirs. Features of interest include the 16th century gallery, the pew of the Earls of Bath. The tomb of Lady Fitzwarren and the monument of Rachel, Countess of Bath are in the chancel aisle. The tomb of Sir John Wray is a large slate-covered tomb-chest with decorated slate back-plate, the tomb was originally at St Ive in Cornwall because a Wray had married a Bourchier in 1652 and it was brought here in 1924. The manor of Tawstock was an important one in North Devon and it was held successively by the families of de Totnes, de Braose, de Tracy, FitzMartin, FitzWarin, Hankford and Wrey. The present Wrey baronet still lives within the manor and retains ownership of much of the land within the parish, but no longer owns Tawstock Court. All that remains of the Elizabethan mansion re-built by William Bourchier, 3rd Earl of Bath is the gatehouse, the house burned down in 1787 and was rebuilt in the Neo-Gothic style by about 1800. Sir Albany Bourchier Sherard Wrey, 13th Baronet, let Tawstock Court to St Michaels Preparatory School, the 14th Baronet sold it to the school which continued to occupy it until it went into administration in 2012. Later that year it was bought by a property investor and developer, as part of the sale the nursery school division of St Michaels School continued to operate as of 2013 in the stable blocks to the immediate west of the house. The family retained its ancient seat of Liscombe until 1907, Edward Lovetts sister Anne Lovett became the second wife of Edward Bourchier, 4th Earl of Bath, of Tawstock Court, but the marriage was without children. She married secondly to Baptist Noel, 3rd Viscount Campden, Sir Henry Northcote, 4th Baronet, a physician, married Penelope Lovett and heiress of Edward Lovett. Woolacombe is a seaside resort on the coast of North Devon, which lies at the mouth of a valley in the parish of Mortehoe. The beach is 3 miles long, gently sloping, besides tourism, Woolacombe has a thriving biscuit industry. It is a destination for surfing and family holidays and is part of the North Devon Coast Area of Outstanding Natural Beauty. The beach has been managed by Parkin Estates Ltd for over half a century and has over the years continuously been recognised as one of the best beaches in Europe, the beach water quality is monitored regularly by the environment agency and meets its highest standards. The winter population is small, but during the summer large numbers of people come to the village for their holidays. Many are motivated to visit because of the excellent surfing conditions found locally, there are many hotels, holiday flats, holiday parks and bed and breakfast establishments, and most of the entertainment opportunities are aimed at tourists. The village is served by an independent pharmacy which is open all year round. This attraction was demolished and rebuilt as a themed crazy golf course in 2010. Due to Atlantic waves, the swell is at somewhat large, right across from the beach, there are panoramic views of Lundy Island. Woolacombe has the benefit of low cliffs at either end of the beach which are home to the maritime heathland as well as sand dunes behind the beach. Much of the close to the village is owned and cared for by the National Trust. 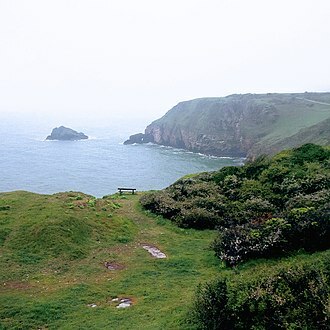 The coast itself is part of the North Devon Voluntary Marine Conservation Area because of its diverse, when Lady Rosalie Chichester, the last of the line, died in 1949 it had been in her family’s possession for over 800 years. On her death the Chichesters land in Woolacombe and Mortehoe and the estate at Arlington near Barnstaple had been willed to the National Trust. However, the beach and some surrounding land had previously purchased by Stanley Parkin. Ray Parkin, the current chairman, has been involved with the development and management of the company since 1985. Lynmouth is a village in Devon, England, on the northern edge of Exmoor. The village straddles the confluence of the West Lyn and East Lyn rivers, in a gorge 700 feet below Lynton, both villages are connected by the Lynton and Lynmouth Cliff Railway, which works two cable-connected cars by gravity, using water tanks. The two villages are a civil parish governed by Lynton and Lynmouth Town Council, the parish boundaries extend southwards from the coast, and include hamlets such as Barbrook and small moorland settlements such as East Ilkerton, West Ilkerton and Shallowford. Lynmouth was described by Thomas Gainsborough, who honeymooned there with his bride Margaret Burr, the Sillery Sands beach is just off the South West Coast Path and is used by naturists. Percy Bysshe Shelley, his wife Harriet and his sister-in-law Eliza stayed in Lynmouth between June and August 1812, Shelley worked on political pamphlets and on the poem Queen Mab. A lifeboat station was established in Lynmouth on 20 January 1869, the lifeboat was kept in a shed on the beach, until a purpose-built boat house was built at the harbour. This was rebuilt in 1898 and enlarged in 1906–07 and it was closed at the end of 1944 because other stations in the area could provide cover with their newer motor lifeboats. The boat house was used as a club, but was washed away in the flood of 15 August 1952. It has since rebuilt, and now includes a public shelter. She had been under tow, but the tow rope had broken and she was dragging her anchor and had lost her steering gear. The alarm was raised for the Louisa, the Lynmouth lifeboat, launching was impossible because of the terrible weather. Jack Crocombe, the coxswain of the Louisa, proposed to take the boat by road to Porlocks sheltered harbour,13 miles around the coast, the boat plus its carriage weighed about 10 tons, and transporting it would not be easy. 20 horses and 100 men started by hauling the boat up the 1 in 4 Countisbury Hill out of Lynmouth, six of the men were sent ahead with picks and shovels to widen the road. The highest point is 1,423 feet above sea level, after they had crossed the 15 miles of wild Exmoor paths, they had to descend the dangerous Porlock Hill, with horses and men pulling ropes to stall the descent. Landkey is a small village in the county of Devon in the south-west of England with a population of 2274, falling to 1,734 at the 2011 census. It is situated 3 miles from the nearest town of Barnstaple, the village is a major part of the electoral ward called Landkey and Taw. The total ward population at the census was 4,957. It was formerly believed by locals that Landkey was founded by Sir Francis Drake in 1586 as a settlement to escape from the Spanish Armada. This supposition is now categorised as a mistruth legend, kea and a brother Celtic monk, are known to have worked together in the evangelisation of these parts, probably in the late 5th century. The coming of the Saxons often caused the changing of Celtic church dedications to those of more universally accepted, place names are more difficult to change. Thus Saint Keas name persists in the name of Landkey. Today, the dedication of both churches is to St. Paul. Landkey church, dedicated to Saint Paul, is a building, entirely late 15th century. The interior is plastered and whitened throughout, with ceiled and bossed roofs, the North aisle contains three stone effigies of the Beaupels, who held the manor of Landkey under the Bishop of Exeter. The small South transept is the Acland Chapel, and contains a fine coloured monument to Sir Arthur Acland and his wife. The Aclands, one of the most notable of Devon families, originated within the parish at Acland Barton and they continued to own it until 1945, when Sir Richard Acland sold it to the tenant. Sir Arthur Acland purchased the estate of Killerton some 32 miles to the south, the parish now forms part of the Benefice of Swimbridge with West Buckland and Landkey, the current incumbent is the Revd. Landkey is noted for its variety of sweet cherry called Mazzard fruit which was discovered by farmers in the early 1800s. Landkey Parish Council have rescued Mazzard trees from the brink of extinction, they were common in North Devon. The parish council won a £35,000 matching grant through the Countryside Agencys Millennium Green project to pave the way for creating a 2-acre orchard as part of a wider Millennium Green project. Combe Martin is a village, civil parish and former manor on the North Devon coast about 4 miles east of Ilfracombe. 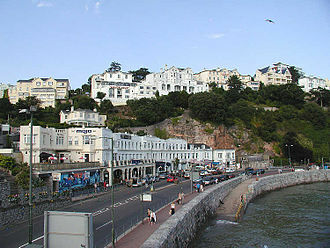 It is a seaside resort with a sheltered cove on the north-west edge of the Exmoor National Park. Due to the narrowness of the valley, the village consists principally of one long street which runs 2 miles between the valley head and the sea. An electoral ward with the name exists. The ward population at the 2011 census was 3,941, evidence of Iron Age occupation includes the nearby Newberry Castle fort. The toponym Combe is derived from Old English cumb meaning wooded valley and it derives ultimately from the same Brythonic source as the Welsh cwm, of the same meaning. The name was recorded as Comer in 1128, the Martin suffix on the place name is from the name of the FitzMartin family, feudal barons of Barnstaple, from which large barony the manor of Combe was held. There are several disused silver mines on the ridge and evidence of tunnels can still be seen. There are items in the Crown Jewels made from Combe Martin silver, the unusual dedication of the Church of England parish church to St.
Peter ad Vincula is derived from the ancient Basilica of San Pietro in Vincoli in Rome. One of the unusual features is the Pack o Cards public house built around 1700 by George Ley. Reputed to have been funded by his successes, it originally had 52 windows,13 rooms. It is believed that the street is the longest village street in England and it was recently measured at around a mile and a half long. The actual longest street is Stewkley, the myth has several possible origins, Combe Martin has the Guinness world record for the worlds longest street party, this can easily be confused as longest village street. Many people measure Combe Martin from one you are entering Combe Martin sign to the other, one of the signs is placed an unusually long way from the village which can lead to confusion. Combe Martin has several very active pubs, there is a saying in Combe Martin that At the George and Dragon they talk about my sprained thumb, at the Dolphin they talk about my broken leg. Basically saying is that at the pubs at Combe Martin stories really have a chance to be exaggerated and maybe such is the case here. Lynton was once the terminus for the narrow-gauge Lynton & Barnstaple Railway, which served both towns. The two communities are governed at local level by Lynton and Lynmouth Town Council, in Lynton is the Parish Church of St Mary, which stands overlooking the sea, surrounded by shops and hotels. The tower is mainly 13th century but the church itself has been enlarged and altered — most notably in 1741, when the nave was rebuilt, many of the towns buildings were constructed in the latter part of the 19th century and the early 20th century. The town hall was given to the town by Sir George Newnes, a major benefactor of the town, it was opened on 15 August 1900. He gave the town the Congregational church on Lee Road, evidence of Iron Age activity can be found at the nearby Roborough Castle. The novel Lorna Doone was set in the Lynton area, half a mile to the west are the spectacular Valley of Rocks and Wringcliff Bay. The British technical modern rock band InMe make semi frequent lyrical references to the Lynton/Lynmouth area in their lyrical material, Lynton is name-checked in In Loving Memory on their third album Daydream Anonymous and Lynmouth is name checked in Saccharine Arcadia on Phoenix, The Very Best of InMe. For the small village near Bodmiscomnbe named Goodleigh, see Goodleigh, Bodmiscombe. Goodleigh is a village, civil parish and former manor in North Devon, the village lies about 2 1/2 miles north-east of the historic centre of Barnstaple. Apart from one adjunct at the south, it is generally a linear settlement, the parish church of St Gregory is a grade II* listed building with surviving ancient parts but was largely rebuilt in 1881. Two 17th century mural monuments survive in Goodleigh Church to members of the Acland family of Combe, the descent was as follows, James I Acland of Combe, who married Margaret Markham of Barnstaple. James was the son of Anthony Acland of Hawkridge, Chittlehampton. Thomas I Acland, eldest son and heir, who married Katherine Palmer of Barnstaple, James II Acland, who died without progeny. His mural monument survives in Goodleigh Church and he was the son and heir of Thomas II Acland, by his wife Agnes Shepherd. Agnes survived him and remarried to Rev. Josias Gole, yeotown is situated in the sequestered wooded valley of the small River Yeo, about 1 mile south-west of the village of Goodleigh. Swimbridge is a village in the English county of Devon. It is 4 miles south-east of Barnstaple and twinned with the town of St. Honorine Du Fay in Normandy and it was the home of the Rev. John Jack Russell who first bred the Parson Russell Terrier. The name Swimbridge originates from the clergyman Sawin Birige, who founded a chapelry at Swymbridge in Anglo-Saxon times, Birige held lands around the village which were known as Birige. Before the changes to parish boundaries in 2003, at 7,280 acres it was one of the largest in North Devon, the village is noted for its church which has been described as a treasure house due to its fine carvings and memorials. The village was the home of the Rev. John Jack Russell who first bred the Parson Russell Terrier. John Russell died in 1883 and his grave can be found in the graveyard of St. Jamess Church, from 1873 to 1966, Swimbridge had a station on the Devon and Somerset Railway, which became part of the Great Western Railway and which ran from Taunton to Barnstaple. Braunton is an English village, civil parish, ecclesiastical parish and former manor in North Devon. The village is situated 5 miles west of Barnstaple, while not the largest village in England, it is amongst the most populous in Devon with a population at the 2011 census of 7,353 people. Their joint population at the census was 8,218. 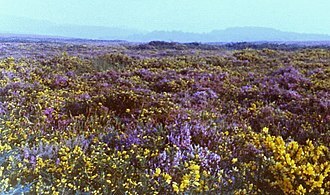 Within the parish is the fertile, low-lying Braunton Great Field, which adjoins the undulating Braunton Burrows, the Core Area in North Devon Biosphere Reserve, the largest psammosere in England. It confronts the Atlantic Ocean at the west of the parish at the beach of Saunton Sands. Braunton is derived from the two Old English elements, brōm, meaning broom shrub, and tūn, meaning farmstead or settlement and it thus signifies, farmstead where broom grows. The name is recorded in the Domesday Book of 1086 as BRANTONE, the South West Coast Path National Trail passes through the village and gives access for walkers to the spectacular North Devon coast. The Tarka Trail passes through the village, Braunton Burrows marsh on the west side of the parish is a designated biosphere reserve, the first place in Great Britain to have gained such status. The north of Braunton Burrows are open to public access and have been converted into a Links Golf Course. Braunton was half-surrounded by an extensive brackish salt-water marsh restricting available agricultural land, in 1808 this was surveyed by Charles Vancouver, for the Board of Agriculture, who recommended that the marsh should be enclosed and reclaimed. This met with approval and James Green was appointed as engineer for the drainage scheme. An Act of Parliament was obtained for the purpose on 25 May 1811, the scheme was completed by the addition of a new quay at Velator in the 1870s. Braunton has a climate that is heavily moderated by the proximity to the Atlantic. Braunton was the manor of Braunton Hundred, and had been held by Saxon kings. Between 855 and 86010 hides in Brannocminster were granted by King Æthelbald of Wessex to Glastonbury Abbey, after the Norman Conquest of 1066 the manor continued as a royal possession, in the demesne of King William the Conqueror. In the Domesday Book of 1086 it is recorded as held at farm by Baldwin the Sheriff, Sheriff of Devon, together with the Rectory of Braunton, it shortly afterwards came into the possession of the Dean of Exeter. Chulmleigh is a small Saxon hilltop market town and civil parish located in North Devon in the heart of the English county of Devon. It is located 20 miles north west of Exeter, just north of the Mid Devon boundary, linked by the A377 and B3096 roads. The parish is surrounded, clockwise from the north by the parishes of Kings Nympton, Meshaw, East Worlington, Wembworthy, Ashreigney and Chittlehamholt. In 2001 the population of the parish was 1,308, an electoral ward with the same name exists whose total population at the same census was 2,081. Chulmleigh has some old architecture with many cob and thatched buildings. It is located close to the Tarka Railway Line, Kings Nympton Railway Station is within the parish, although it is around 2 miles from the town, and Eggesford station is closer to the town. Chulmleigh has a fire station which is part of Devon and Somerset Fire. The secondary school is the Chulmleigh Community College has been amongst Devons highest GCSE league tables, the towns pub is the Old Court House. Fremington is a very large village, civil parish and former manor in North Devon, the historic centre of which is situated three miles west of Barnstaple. There is a ward with the same name. The ward mainly covers the village and the population at the 2011 census was 4,310, Fremington is situated between the south bank of the tidal estuary of the River Taw and a small inlet of that river known as Fremington Pill. Fremington Quay was formerly a port on the River Taw, half a mile north of the village centre, Fremington was formerly a borough which sent members to Parliament in the reign of King Edward III. The parish includes the former hamlets of Bickington to the east. Fremington hundred was one of the 32 historic hundreds of Devon. little Bridge House in the village is a childrens hospice run by Childrens Hospice South West. The parish church, dedicated to St Peter, was subject to thorough Victorian restoration in 1867 to the designs of the leading architect Sir George Gilbert Scott, the stone pulpit was buried during the Reformation and retains traces of the colour of the earth. St Peters medieval tower unusually is positioned at the east end of the church and it was re-modelled in the 19th century by his eventual heirs the Arundell-Yeo family. It is now a retirement home, Fremington has two public houses, The Fox and the New Inn, situated almost next door to each other. Fremington is famous for Fishley Pottery, made by the family of that name in the Combrew area, examples of which are in the collection of the Museum of Barnstaple and North Devon. Excellent, stone-free clay pits exist in the half of the parish and were owned by Brannams Pottery. Two patches of boulder clay lie over the centre of the parishs bedrock, the next nearest boulder clay deposits are in the Gower Peninsula, South Wales, approximately 45 miles due north of Fremington across the Bristol Channel. The nearest deposit of clay in England is in the central Cotswolds,6 miles due east of Bourton-on-the-Water. The existence of the clay is puzzling as the southernmost limit of the Devensian glaciation is believed to have been located over South Wales. Umberleigh is a former large manor within the historic hundred of Tawton, but today a small village in North Devon in England. It used to bed an ecclesiastical parish, but following the building of the church at Atherington it became a part of that parish and it forms however a part of the civil parish of Chittlehampton, which is mostly located on the east side of the River Taw. The site was occupied by the manor house of Umberleigh, the present Georgian manifestation of which. Next to the house in about 1275 was founded Umberleigh Chapel. According to the Devon historian Tristram Risdon, Umberleigh was a manor held in demesne by King Athelstan, King of the West Saxons from 924 to 927. He built at Umberleigh a palace and next to it a chapel dedicated to the Blessed Trinity which served the royal family and household. Within the manor of Umberleigh Athelstan founded two churches, at Bickington, now High Bickington and at Atherington, each of which he endowed with two hides of land. Immediately prior to the Norman Conquest of England in 1066 the manor of Umberleigh had been held by Brictric and he was probably the great Saxon thane Brictric son of Algar. A person named Brictric was the pre-Conquest holder of the possession in Dorset of the Church of the Holy Trinity of Caen. The building work began in 1062 and finished in 1130 and he was succeeded by his son, either Gilbert, or Phillip de Soleigny. Both father and son fought under King Henry II during his battles to succeed King Stephen, for her dowry Hawis was given by her father the manor of Stoke Rivers, which thus passed to her husband. Gilbert/Phillip de Soligny left a daughter Mabill de Soligny as sole heiress, the Champernon family, sometimes Latinised Campo Arnulfi originated in the Cambernon area of Lower Normandy, and their arrival in England was associated with the Norman Conquest. Many members of the adopted alternate spellings such as Champernoun, Champernowne. The immediate line of descent from Jordan and Mabill de Champernon is unclear, according to Risdon, their sole heir was a daughter, Joan de Champernon. However, Poles account assigns two sons to Jordan and Mabill, Richard de Champernon, who died without issue, and Jordan de Champernon. The tower of St Hieritha's Church is, in the opinion of many, unsurpassed in design and proportion among English village churches. Bishop's Nympton: St Mary's church. Stone bust of Hugh Squier (1625-1710), within an aedicule on facade of South Molton Town Hall. Inscribed on plinths: "Hugh Squier AD 1625-1710. Our great benefactor. Erected AD 1910, James Sanders, Mayor"